– have you completed a version of it with a living wall on the south side? – Would the optional loft extend across the top half of the living/kitchen area, or would it/could it cover more than that? – Are there other types of roof that would work well with this besides recycled metal? I live in Brazil, and recycled metal is very expensive. All the DIY/organic houses I’ve seen still use ceramic tiles for roofing, or a few have living roofs. No one to my knowledge has combined this plan with a living wall, but that’s a great idea. The loft also goes over the bedroom. You could use tiles for roofing, that’s another good idea. 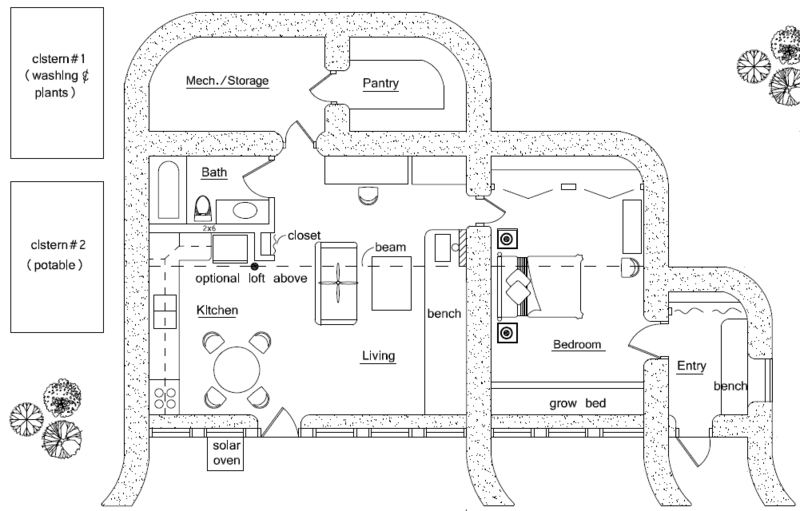 This may be a silly question, but – would it affect the function of the house any to change the form to just a rectangle? 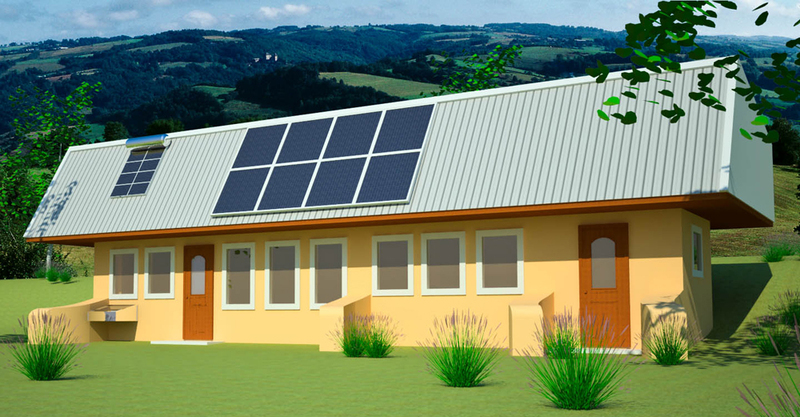 I’m joining an ecovillage in Texas, east of Dallas, which is building using CEB and the rubble trench foundation. Although I have always wanted to do a dome or a yurt, the storage building they (we) are building has convinced me that four exterior walls (maybe one double wall) is the best way to go. The bedroom could be stretched out to the back and maybe the pantry made longer, right? I’m just not sure about the entry. Is that second entry necessary for code reasons (second entry)? Or could a second door be put in the back if it were stretched out? I wish you still customized plans. 🙂 I used to want the Zero Energy 4, but now I want this smaller one, and eventually I will add on an art studio. Sure, you could change things around a lot. The doors are for cold climates (air locks). The curved walls are for added strength to resist soil pressure when earth bermed. Oh, okay. Texas is definitely not that cold. 🙂 not normally, anyway. Thanks!